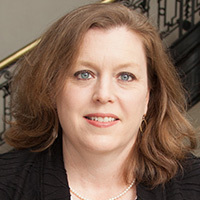 Kristin A. Goss is associate professor of public policy studies and political science at Duke University and director of the university’s semester-in-Washington program. Goss’s research focuses on civic engagement and interest groups in American politics. She is the author of three books: The Paradox of Gender Equality: How American Women’s Groups Gained and Lost Their Public Voice; Disarmed: The Missing Movement for Gun Control in America; and The Gun Debate: What Everyone Needs to Know (with Philip J. Cook). Goss also has published articles on puzzling trends in volunteering, on the role of philanthropic foundations in the women’s movement, and on the ways that public policy shapes political participation, among other topics. She worked for four years on the research team for Robert Putnam’s seminal work, Bowling Alone (2000), which charts seismic shifts in American civic engagement. Before entering academe, Goss was a Washington-based journalist for six years covering non-profit organizations and foundations for The Chronicle of Philanthropy. She received a B.A. degree with high honors from Harvard; a master’s degree in public policy from Duke; and a Ph.D. in political science from Harvard. Goss is an active member of the League of Women Voters of Arlington (VA) and served as President from 2013-16.